By education and experience, I have spent many of my working days solving problems most of us only face once or twice a lifetime – which plants in a particular neighborhood do deer really ignore? 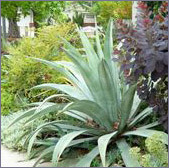 How can you reduce your water and maintenance (i.e., “mow and blow”) budget and still have a great-looking garden? What plants truly do give you four-season color? I also have a sense of the “hidden costs” of many garden choices (e.g., fescue lawns that necessitate frequent watering, weekly “mow and blow” service and large amounts of synthetic fertilizer). I’ve helped my clients do garden makeovers that allow them to reduce their maintenance service budget to a fraction of what they’d been spending before. As a result, they can reduce their annual costs by paying for a half-day of expert pruning, weeding, and mulching a few times/year. This all adds up to healthier gardens and significantly less waste on all levels! I try to stay current with design trends, Integrated Pest Management (IPM) strategies, and local landscape ordinances. I meet regularly with other professionals in the green industry to talk about issues that affect my clients. I organize and attend industry educational forums, and have contacts with many of our area’s leading landscape materials businesses and contractors. I’ve worked on a wide range of projects, including outdoor patios; trellis and arbor designs; hardscape pathways and driveways; redwood decks; Japanese gardens; bocce-ball courts; and even green roofs! Before concentrating on residential landscape design, I worked on environmental land use planning and engineering projects throughout California and the western United States. This early work taught me a lot about how good design and attention to detail can mean the difference between long-term success and failure. I also learned the value of establishing a network of “go-to” colleagues and technical resources to draw on, in order to provide the best possible value to my clients. I hold an advanced degree in Landscape Design and Environmental Construction. Besides my own residential design clients, I managed the Maintenance Division for several years at an award-winning landscape design and construction company on the Peninsula. This latter experience greatly expanded my understanding of what it takes to keep a garden looking good over time, especially as it pertains to soil and plant health. And when I do garden walk-throughs with my clients, I am often able to provide an added level of service by identifying problems you may not have even been aware of — pest and plant disease problems, and irrigation-related issues — along with solutions. If I don’t know the answer, I can direct you to someone who will. And if they’re interested, I also like to provide hands-on training for my clients, in order to develop their skills throughout the garden.